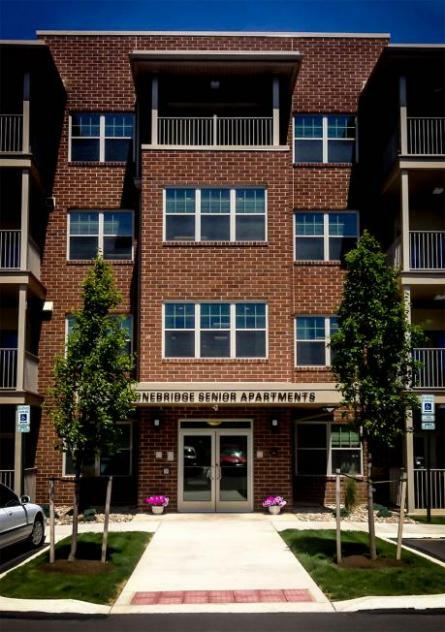 Stonebridge Senior Apartments is a four-story building with an elevator. The building includes 58 units of senior housing, providing (24) one-bedroom, and (34) two-bedroom units. The building configuration consists of two resident wings with a double-loaded corridor on all four floors, splayed from a central core. These core areas provide for first floor primary building entry and vertical circulation via elevator as well as other supplementary spaces. To serve the needs of the tenants and located in the central core are various community areas, including lobbies, laundry, community room with kitchen, library/ computer room, and tenant out-of-season storage. Core Management areas include management office with adjacent file storage and building maintenance and service areas. Offices for Component Support Services, with storage, are also provided.